This breakthrough could be one of the most important developments since the gene for Huntington’s disease was discovered in 1993. The trial of the revolutionary new ‘gene silencing’ treatment is being led by scientists at UCL’s Institute of Neurology. Huntington’s is a deadly degenerative brain disease that strikes in the prime of life. It kills brain cells, slowly draining patients of their movement control, personality and thinking skills. It is one of the commonest genetic brain diseases and devastates whole families. Everyone with the gene for the disease will fall ill with Huntington’s disease at some point. There is no cure, and there is currently no treatment that can prevent it or slow it down. The new drug, called ISIS-HTTRx, targets the root cause of the disease, a toxic protein called mutant huntingtin, which is caused by a faulty gene in the patients’ brain cells. The drug is administered directly into the fluid that surrounds the brain and spinal cord at the base of the patients’ spine, from where it migrates to the brain. 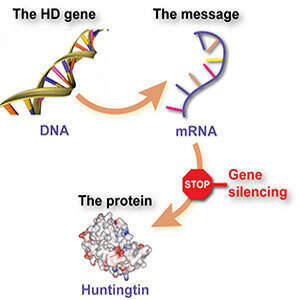 In Huntington’s patients, the faulty gene produces messenger molecules, called messenger RNA, that trigger the production of mutant huntingtin in the brain. But the drug is designed to bind with the messenger molecules, forcing the cells to dispose of them instead of churning out the toxic protein. This type of treatment is known as an ‘antisense’ drug. In theory, ISIS-HTTRx could prevent or possibly reverse the toxic effects of the protein, stopping the disease in its tracks. This new human trial is focused on testing the safety of the drug in volunteer patients who are in the very early stages of Huntington’s disease. The study will evaluate the safety of increasing doses of ISIS-HTTRx compared to placebo. In addition, researchers will be looking for chemical signs that the drug is having the desired effect, by measuring the level of mutant huntingtin protein in the cerebrospinal fluid using a newly-developed test. The final assessment of whether the drug is effective will take place in later phases of testing. However research on mice that produce the mutant huntingtin protein has been extremely promising. These mice display symptoms similar to those seen in patients with Huntington’s disease. When these mice were dosed with ISIS-HTTRx, they showed improvements without serious side-effects. The drug is being developed by Isis Pharmaceuticals in collaboration with Roche. In the UK, the first doses of the drug were administered at UCL’s new Leonard Wolfson Experimental Neurology Centre.